This has not been the start that Arkeel Newsome was envisioning for his senior season. The holder of pretty much every rushing and touchdown scoring record in Connecticut high school football history came into his final collegiate season looking to join Lyle McCombs, Taber Small, Jeff Gallaher, Tony Jordan and Bill Minnerly as the only players in UConn program history to lead the Huskies in rushing in three straight seasons. Newsome had five 100-yard rushing games combined during his sophomore and junior seasons but two games into the 2017 campaign, eight of his 14 carries have gone for either no gain or negative yardage. If not for back to back runs of 4 and 9 yards in garbage time in last week's loss to Virginia, Newsome's numbers of 14 carries for 17 yards would look even worse. Redshirt freshman Nate Hopkins led UConn in rushing in the season opening win over Holy Cross, true freshman Kevin Mensah had 49 yards, all in the second half, against Virginia last week. The Huskies get 92.2 percent of their rushing yards from the running back position out of freshmen which leads all FBS programs just ahead of Louisiana-Lafayette's mark of 91.5. The good news is that Newsome's impact isn't limited to merely running with the ball. 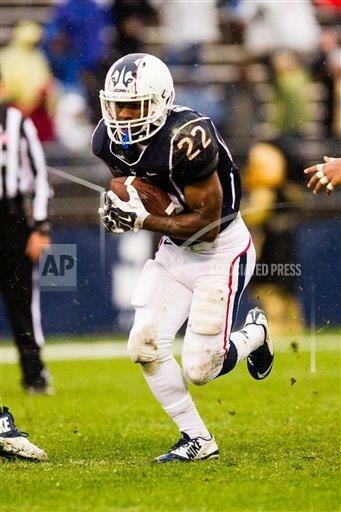 He needs 22 yards to become the first running back in UConn history with more than 1,000 receiving yards. If he gets there on Sunday, he will become the fourth active FBS back to reach that milestone joining Washington State's Jamal Morrow, Southern Mississippi's Ito Smith and Ohio's Papi White. With 86 career catches, Newsome is five shy of Joe Markus' program record for running backs set from 1979-82. He also ranks seventh among active FBS running backs in that category. Also, with 4,313 career all-purpose yards Newsome is 74 shy of moving past Jordan Todman and into third place in that category in UConn history. 155 Jamal Morrow, Washington State vs. Nevada, Saturday, 6 p.m.
114 Ito Smith, So. Mississippi at Louisiana-Monroe, Saturday, 7 p.m.
103 Alex Gardner, FIU at Rice, Saturday, 7:30 p.m.
102 Phillip Lindsey, Colorado vs. Washington, Saturday, 10 p.m.
98 Larry Rose, New Mexico State vs. UTEP, Saturday, 8 p.m.